BFD over LAGs | Routing Freak! We all love Bi-directional Forwarding Detection (BFD) and cant possibly imagine our lives without it. We love it so much that we were ready with sabers and daggers drawn when we approached IEEE to let BFD control the individual links inside a LAG — something thats traditionally done by LACP. Having done that, you would imagine that people would have settled down for a while (after their small victory dance of course) — but no, not the folks in the BFD WG. We are now working on a new enhancement that really takes BFD to the next level. There isnt anything egregiously wrong or missing per se in BFD today. Its just not very optimal in certain scenarios and we’re trying to plug those holes (and doing our bit to ensure that folks in data comm industry have ample work and remain perennially employed). Ok, lets not be modest – there are some scenarios where it doesnt work (as we shall see). So what are we fixing here? Well for one, BFD takes awfully looooong to bring up the session. Remember BFD starts with sedate timers and then slowly picks up (each side needs to come to an agreement on the rate at which they will send packets) . So it takes a while before BFD can really be used for path/end node liveliness detection. If BFD is being used to validate an MPLS path/LSP then it will take a few additional seconds for BFD to come up because of the LSP ping bootstrapping procedures (RFC 5884). In certain deployments, this delay is bad and we want to eliminate it. It is expected that some MPLS deployments would require traffic engineered LSPs to be created dynamically, driven by external applications as in Software Defined Networks (SDN). It is operationally critical to ensure that the forwarding paths are up (via BFD) before the applications start utilizing the newly created tunnels. We cant hence wait for BFD to take its time in coming up since the applications are ready to push data down the tunnels. 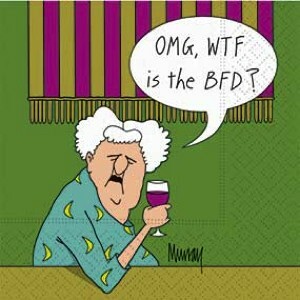 So, something needs to be done to get BFD to come up FAST! This is an issue in SDN domains where a centralized controller is managing and maintaining the dynamic network. Since the tunnels are being engineered by this centralized entity we want to be really sure that the new tunnel is up before sending traffic down that path. In the absence of additional control protocols (eg. RSVP) we might want to use BFD to ensure that the path is up before using it. Current BFD, with large set up times, can become a bottle neck. If the centralized controller can quickly verify the forwarding path, it can steer the traffic to the traffic engineered tunnel very quickly without adversely affecting the service. The problem exacerbates as the scale of the network and the number of traffic engineered tunnels increase. The “B” in BFD, stands for “Bi-directional” (in case you missed that). The protocol was originally defined to verify bidirectional connectivity between two nodes. This means that when you run BFD between routers A and B, then both A and B come to know when either router goes down (or when something nasty happens to the link). However, there are many scenarios where only one of the routers is interested in verifying the data plane continuity between the two nodes (e.g., static route using BFD to validate reachability to the next-hop router OR a Unidirectional tunnel using BFD to validate reachability to the egress node). In such cases, validating the reverse direction is not required. However, traditional BFD requires the other side to maintain the entire BFD state even if its not interested in the liveliness of the remote end. So if you have “n” routers using a particular gateway, then the gateway has to maintain “n” BFD sessions with all its clients. This is not required and can easily be done away with. Anycast addressing is used for high availability, fast recovery, load balancing and dispersed deployments where the IGPs direct the traffic to the nearest server(s) within a group of potential servers, all sharing the same Anycast address. BFD as defined today is stateful, and hence cannot work with Anycast addresses. With the growing need to use Anycast addresses for higher reliability (DNS, multicast, 6to4, etc) there is a need for a BFD variant that can work with Anycast addresses. BFD works in a binary state – it either tells you that the session is UP or its DOWN. In case of failures it doesnt help you identify and localize the fault. Using other tools to isolate the fault may not necessarily work as the OAM packets may not follow the exact same path as the BFD packets (e.g., when ECMP is employed). There is hence a need for a BFD variant that has some capabilities that can help in fault isolation. So, where does this lead to? We have attempted to fix all the issues that i have described above in a new BFD variant that we call the “Seamless BFD” (S-BFD). Its stateless and the receiver (or the reflector) responds with an S-BFD response packet whenever it receives an S-BFD packet from the source. You can imagine this as a ping-pong game between the source and the destination routers. The source (or the client in S-BFD speak) wants to check if the path to the destination (or the Reflector in S-BFD speak) is UP or the reflector is UP and sends an S-BFD “ping” packet. The Reflector upon receiving this, responds with a S-BFD “Pong” packet. The client upon receiving the “Pong” knows that the Reflector is alive and starts using the path. Each Reflector selects a well known “Discriminator” that all the other devices in the network know about. This can be statically configured, or a routing protocol can be used to flood/distribute this information. We could use OSPF/IS-IS within an AS and BGP across the ASes. Any clinet that wants to send an S-BFD packet to this Reflector (or a server if it helps) sends the S-BFD packet with the peer’s Discriminator value. A reflector receiving an S-BFD packet with its own Discriminator value responds with a S-BFD packet. It must NOT transmit any BFD packet based on a local timer expiration. A router can also advertise more than one Discriminator value for others to use. In such cases it should accept all S-BFD packets addressed to any of those Discriminator values. Why would somebody do that? You could, if you want to implement some sort of redundancy. A node could choose to terminate S-BFD packets with different Discriminator values on different line cards for load distribution (works for architectures where a BFD controller in HW resides on a line card). Two nodes can now have multiple S-BFD sessions between them (similar to micro-BFD sessions that we have defined for the LAG in RFC 7130) — where each terminates on a different line card (demuxed using different Discriminator values). The aggregate BFD session will only go down when all the component S-BFD sessions go down. Hence the aggregate BFD session between the two nodes will remain alive as long as there at least one component S-BFD session alive. This is another use case that can be added to S-BFD btw! This helps in the SDN environments where you want to verify the forwarding path before actually using it. With S-BFD you no longer need to wait for the session to come up. The centralized controller can quickly use S-BFD to determine if the path is up. If the originating node receives an S-BFD response from the destination then it knows that the end point is alive and this information can be passed to the controller. Similarly applications in the SDN environments can quickly send a S-BFD packet to the destination. If they receive an S-BFD response then they know that the path can be used. This also alleviates the issue of maintaining redundant BFD sesssion states on the servers since they only need to respond with S-BFD packets. Authentication becomes a slight challenge since the reflector is not keeping track of the crypto sequence numbers (remember the point was to make it stateless!). However, this isnt an insurmountable problem and can be fixed. For more sordid details refer to the IETF draft in the BFD WG which explains the Seamless BFD protocol and another one with the use-cases. I have not covered all use cases for Seamless BFD (S-BFD) and we have a few more described there in the use-case document.